The hotel that goes above and beyond. Spacious and harmonious, with soft warm hues and a graceful style that reflects the natural beauty of the island, your deluxe ocean view room will be your perfect hideout - a grand haven filled with all the comforts you desire. You will be spoiled by the exclusive amenities, attention to detail and an inspiring view of the Caribbean Sea. Rooms are equipped with two double beds. Spacious and harmonious, with soft warm hues and a graceful style that reflects the natural beauty of the island, your deluxe ocean view room will be your perfect hideout - a grand haven filled with all the comforts you desire. You will be spoiled by the exclusive amenities, attention to detail and an inspiring view of the Caribbean Sea. Rooms are equipped with one king bed. Spacious and harmonious, with soft warm hues and a graceful style that reflects the natural beauty of the island, your deluxe ocean view room will be your perfect hideout - a grand haven filled with all the comforts you desire. You will be spoiled by the exclusive amenities, attention to detail and an inspiring view of the Caribbean Sea. Rooms are equipped with two double beds or one king bed. Enjoy a pleasant stay in this spacious suite, complete with a formal living room with a TV, mini-bar, bathroom and bedroom, which provides everything you need to recharge your batteries and to celebrate life. Discover inner harmony with this dream hideaway offering unforgettable moments and unparalleled views of the Caribbean Sea. Spacious and harmonious, with soft warm hues and a graceful style that reflects the natural beauty of the island, your deluxe room will be your perfect hideout. A grand haven filled with all the comforts you desire. You will be spoiled by the exclusive amenities, attention to detail and an inspiring view of the Caribbean Sea. Rooms are equipped with two double beds or one king bed. Spacious and harmonious, with soft warm hues and a graceful style that reflects the natural beauty of the island, your suite will be your perfect hideout. A grand haven filled with all the comforts you desire. This large suite is an exceptional setting to create new memories with loved ones. It features a king bed, a double bed and stunning view of the Caribbean Sea. Spacious and harmonious, with soft warm hues and a graceful style that reflects the natural beauty of the island, your Master Suite room will be your perfect hideout. A grand haven filled with all the comforts you desire. You will be spoiled by the exclusive amenities, attention to detail and an inspiring view of the Caribbean Sea. Rooms are equipped with one king bed. Decorated with crisp shades of white and light sandy tones, this lovely suite offers a sense of freshness and luxury. Among the most elite accommodations on Cozumel, this large suite features three bedrooms, with two king beds and one double bed. The grand and opulent suite offers a spectacular view of the Caribbean Sea. Located seaside on the western coast of Cozumel. 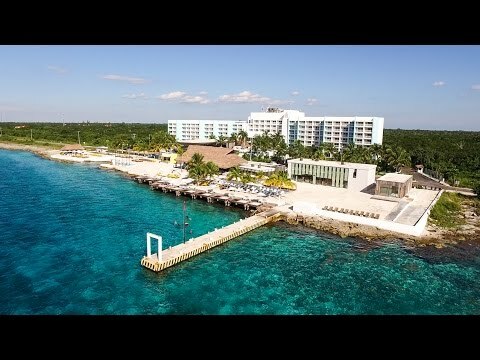 Fiesta Americana Cozumel resort - which shares grounds with its sister property, The Explorean Cozumel - boasts a private beach club, two pools and on-site snorkeling and diving excursions, all of which are included in the room rate. Head down to the water and enjoy a day at the exclusive beach, or take advantage of other recreational amenities including an outdoor pool and a fitness facility. This resort also features complimentary wireless Internet access, concierge services, and babysitting/childcare (for a surcharge). When you`re in need of some rest, settle into your contemporary lodging. Each room comes with a flat-screen TV, a separate shower, complimentary Wi-Fi access and a balcony or terrace with Caribbean Sea views. According to recent Guests, you should request a room above the third floor for the best ocean views. In addition to amenities and activities, meals and drinks at all of the hotel`s on-site bistros and bars are covered by the all-inclusive rate. Overall, the restaurants received high praise from past Guests. Especially Peninsula, which specializes in Asian cuisine, and Rosato, which features an Italian-Inspired menu.